To create a consistent flow of content and connect with your audience you need a smart pinning schedule that may include re-scheduling your best content over a period of time. Tailwind offers the perfect solution: Interval Pin Scheduling! 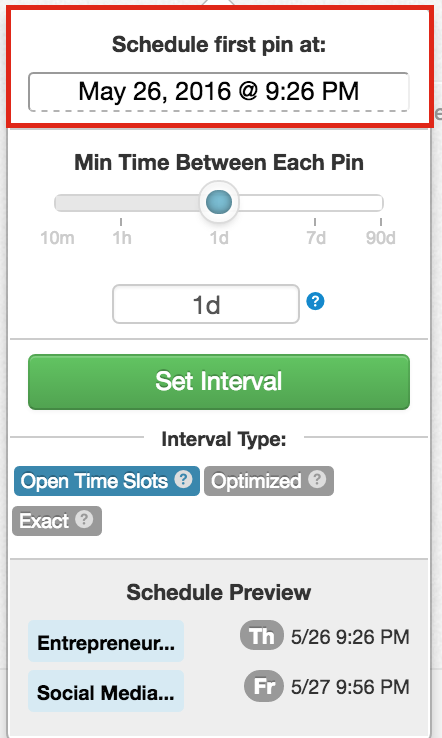 Interval Pin Scheduling allows you to schedule your pins over a specific period of time to multiple boards. Your content will be scheduled to the times you decide, so you can make your pinning feel both organic and interesting for you audience. No matter what your pinning strategy, the Interval tool can take a ton of busywork out of your updating process. To get started, simply add two or more boards to any pin, then select "Use Interval" from the menu. 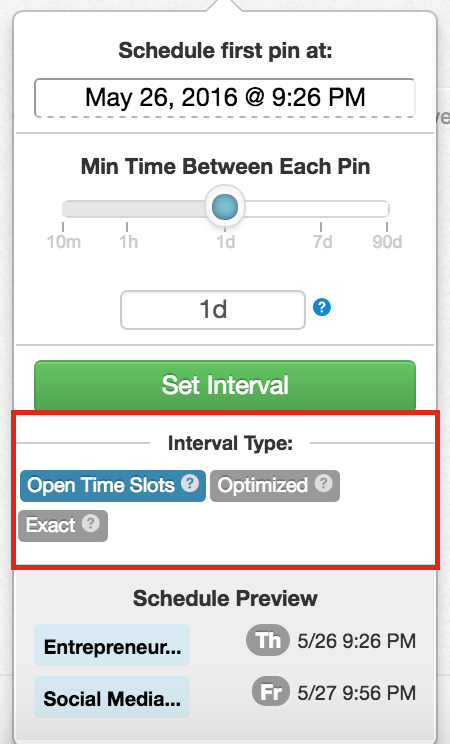 This opens up the Interval submenu, which provides you with some new options for scheduling your pins. 2. The “Schedule first Pin at” time will show you when the first pin will be scheduled to post, and you will notice that it is taking your first available timeslot. This lets you know that when you schedule your Pins, the first pin will be inserted into your schedule directly in that first available time. If you would like to change this time, simply click into the "Schedule first Pin at" box and select the date and time you would like your first pin to be published. 4. Next, decide on what kind of Interval type you would like to use. There are three different options: "Open Time Slots", "Exact" and "Optimized." These provide you with serious flexibility in how your Interval-scheduled pins behave. 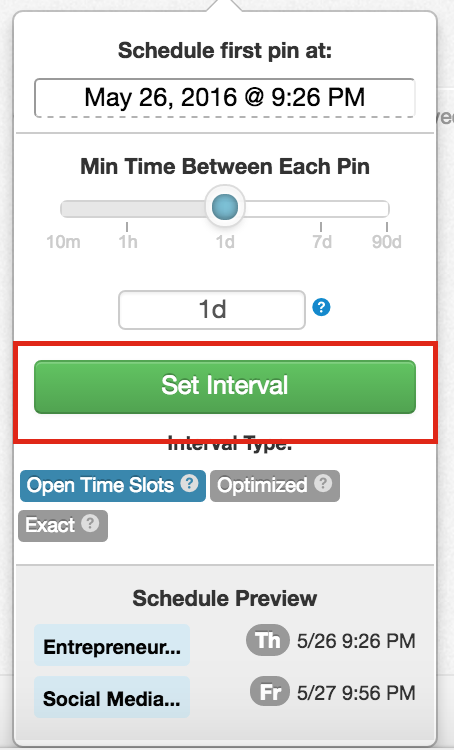 Note: To learn more about your Interval types, hover over the question mark next to each option, or quickly read the "How do I use the Interval Pin Scheduling" article. 5. 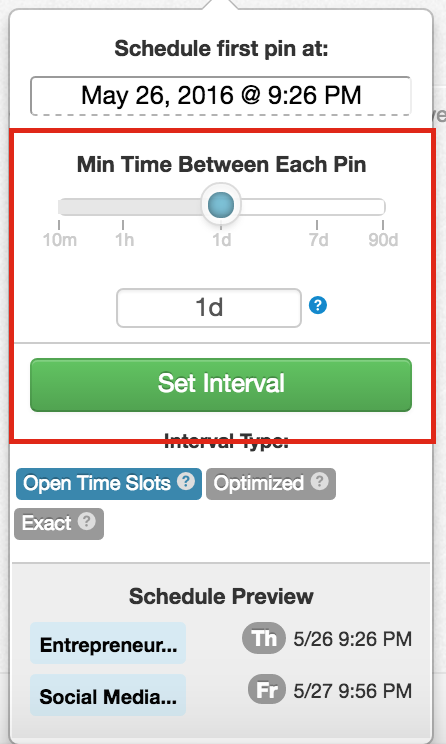 "Set Interval" and then select "Schedule" to send your Pins to the queue. Once scheduled, you will be able to see them in Scheduled Pins page in the queue and calendar view. Note: You will see your interval Pins marked with a lock, and depending on what interval option your use a clock as well. To learn more about what the lock and clock mean, watch the tutorial video below or quickly read "Locking Pins."